Roy Scheider passed away this weekend at the age of 75, after battling cancer for two years. 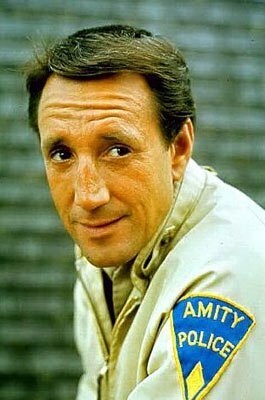 He is famous, of course, for playing Police Chief Martin Brody in Jaws , as well as starring in dozens of other films. And, although it seems to have been overlooked in his various obituaries, he also starred in a movie with me. In parallel with my lengthy IT career, I also moonlighted as a movie extra back in the ’80s. For the princely sum of $40 a day (less $4 to my agent) my acting services were available to any and all production companies choosing to film in the Orlando area. Over a period of several years, I performed in Disney travel videos, commercials, and training and marketing films known as “industrials.” I got to meet Michael Eisner, and I even danced in close proximity to Downtown Julie Brown, which qualifies as my only foray into the horror genre. My career peaked with my performance with Roy in Somebody Has To Shoot The Picture . In this film, a wrongly convicted man awaits his fate on death row while Roy attempts to exonerate him before it is too late. Not to spoil it or anything, but Roy just a bit too late and the man is executed, a dramatic indictment of our inherently unfair criminal justice system. I appear in the very, very, very last scene of the movie. As Roy walks out of the prison, head down and dejected, I can be seen with some other woman and two nuns, kneeling in prayer beside the walkway. Roy walks right next to me as the credits start to roll. We shot this scene at night, and it took all night to get it right. We spent a lot of time hanging out at the caterer’s cart, feasting on the excellent free food. As the shoot dragged on, the writer of the movie, an authentic Left Coast Liberal, polled the crowd of extras to see if we agreed with his political views. When he asked how many people on the set opposed the death penalty, not a single hand went up. This was at a time when Florida was trying to execute Ted Bundy for his serial killing spree, and also trying to legislate a mandatory seat belt law. T-shirts emblazoned with “I’ll buckle up when Bundy does” were popular. The poor writer had no idea of the kind of crowd he was up against. For $40, of course, we could set aside our political differences and act like we opposed the death penalty. Remember, there are no small parts, only small actors. In hindsight, I realize now that shooting movies is a lot like most any IT project. It takes a lot longer than you originally estimated. It takes a lot more people and equipment that you originally thought. You’ll be up all night at some point. You have to do some parts over and over. And the most important aspect of the project is the quality of the free food they provide.